Help two lost tourists to reach the exit and get out of the maze. Switch between characters, collect coins and the bombs, that might help you to blow walls or other obstacles. How fast you can solve riddles? 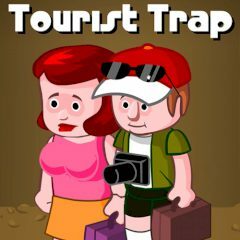 Can you help these two lost tourists to escape the maze and collect as many coins and you can? Well, for the first sight you might think this task is pretty much, but nothing complicated. However, if you take a close look on the location of the things, you will realize it is not that hard as you thought.